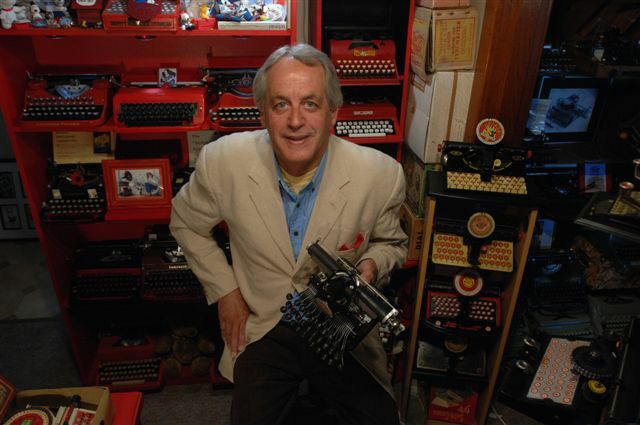 American writer Jeffrey Robinson emailed me overnight, saying he owns this Erika folding portable typewriter upon which Ernest Hemingway wrote his brilliant 1926 novel The Sun Also Rises. 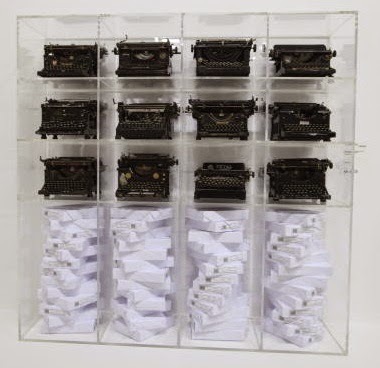 It's almost too good to believe, that one of my all-time favourite novels was written on one of my all-time favourite typewriters (my own version is the Bijou folding, see below). I am generally quite cynical about such claims, but have every reason to believe this email and its contents are genuine. 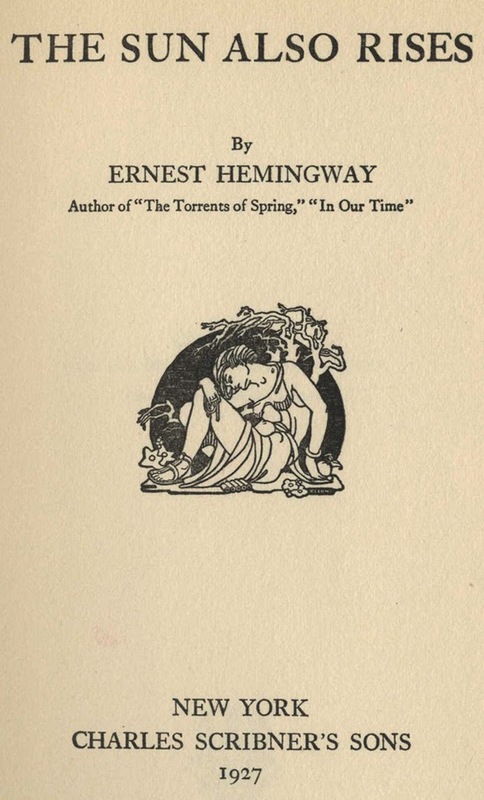 Quite aside from Robinson's possession of the Erika, it reveals details about Hemingway and his first two typewriters, and the one used to write The Sun Also Rises, which - to the best of my knowledge, anyway - have hitherto remained unpublished in print or online. 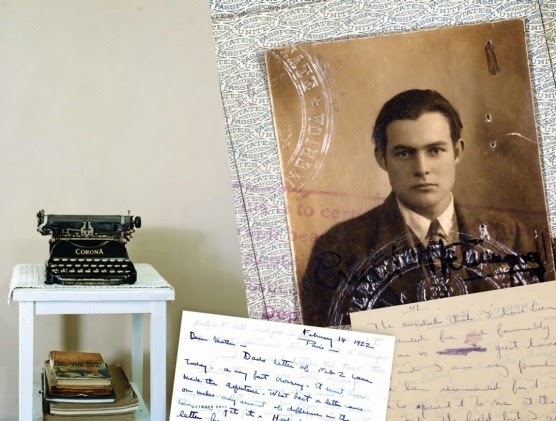 It is well known that Hemingway's first typewriter, a Corona 3 folding portable, was given to him on July 12, 1921, as a 22nd birthday present, by Elizabeth Hadley Richardson (1891-1979), who would become Hemingway's first wife. 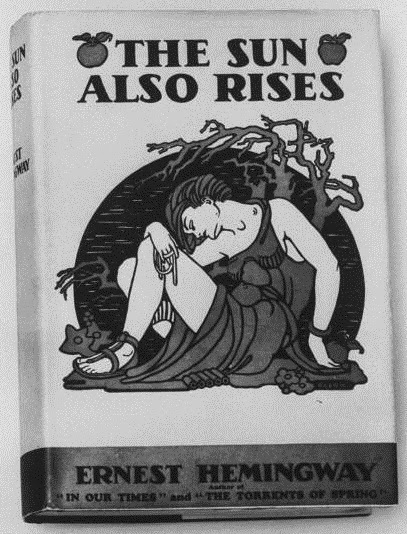 (She thought it was a 23rd birthday gift, believing Hemingway to be a year older than he was.) 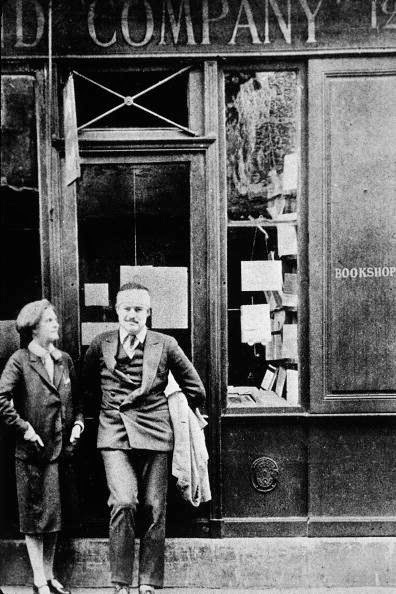 The couple were married in Horton Bay, Michigan, on September 2, 1921, and two months later left for Paris. Letters written home to his mother Grace in February 1922 confirm Hemingway was using the Corona 3 there at that time. See my post on the subject here. Also the Vanity Fair article here. Later, Hemingway also used a range of Royal portable models, including an Arrow, as well as an Underwood Noiseless 77 and even, as some claims would have it, a Halda Model P. But his purchase of an Erika folding to write The Sun Also Rises is a revelation, at least to me. "I ... thought you might like to know the rest of the story. I got this information from [Hemingway biographer] Carlos Baker (1909-1987) when he was at Princeton. 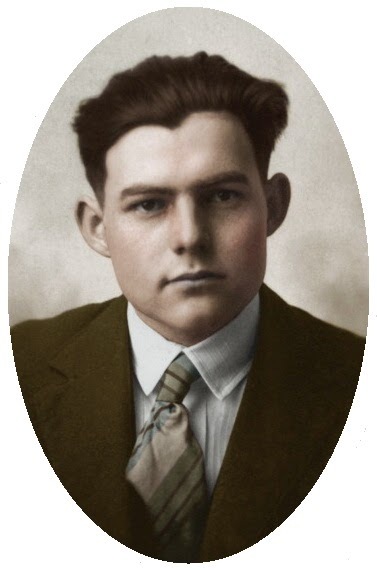 "Hemingway was on his way to Pamplona for the first time [in July 1922]. He took a taxi to the Gare de Lyons (I think that's right) and got into a fight (probably about the fare) with the cab driver. In those days, luggage sat in an open space next to the driver and not in the back with the passenger. As the two argued, the driver got so frustrated that he tossed Hemingway's luggage out onto the street, including the bag (box?) with the Corona. It smashed. 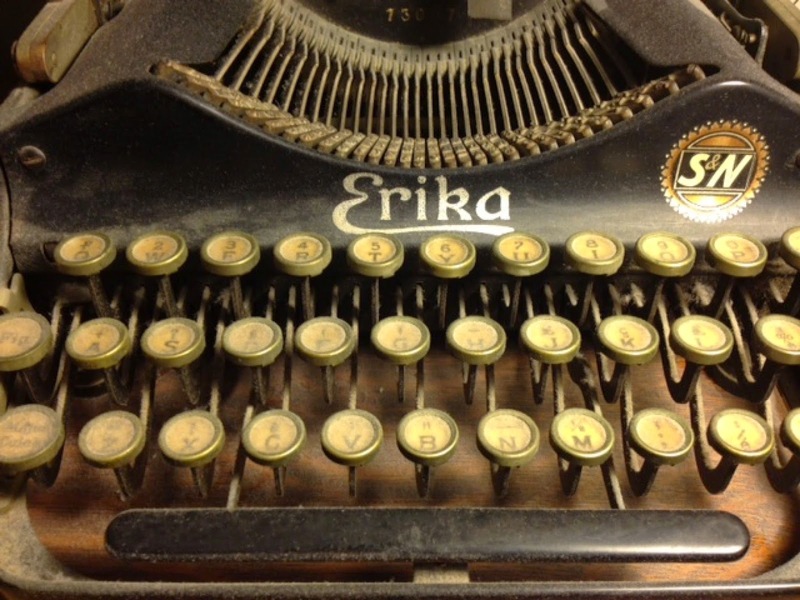 "As soon as he got back to Paris, he bought a used Erika (photo attached) on which he wrote The Sun Also Rises. 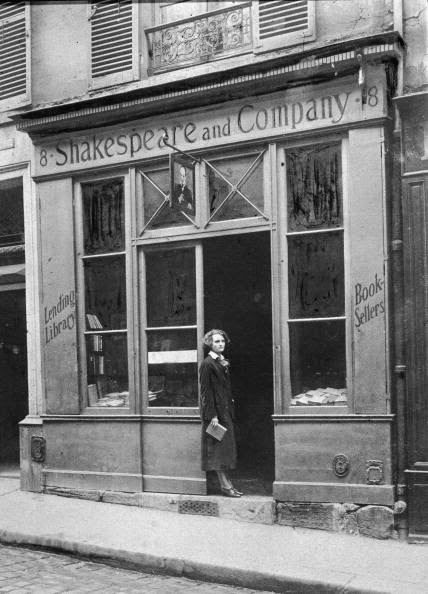 "When he left Paris, he gave the Erika to Sylvia Beach, of Shakespeare and Company bookshop fame. She eventually gave it to an antique dealer friend, whose daughter [Jeanine de Goldschmidt-Rothschild?] 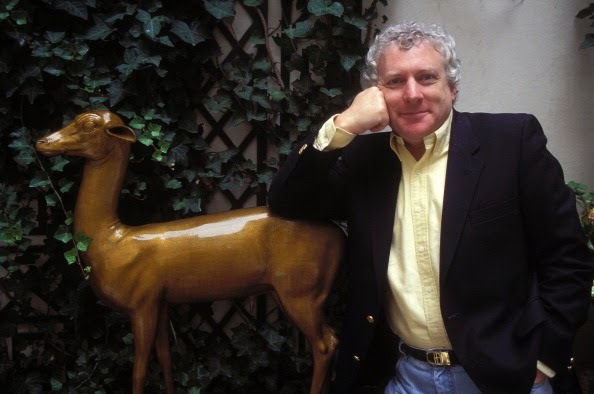 married the French art critic Pierre Restany. The daughter inherited the typewriter. 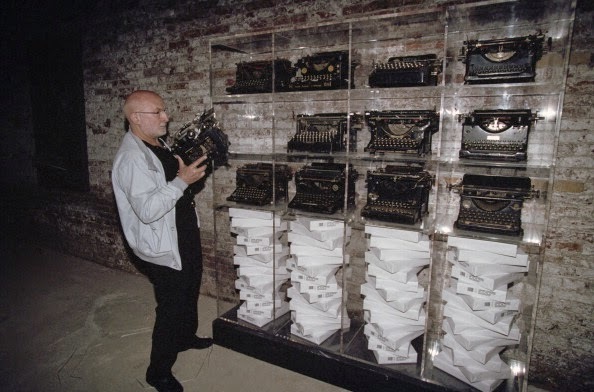 "Restany was friends with the French-born American artist Arman who, among other things, used to slice up objects and remount them. He called them 'Colères' and was famous for doing this with violins, for instance. 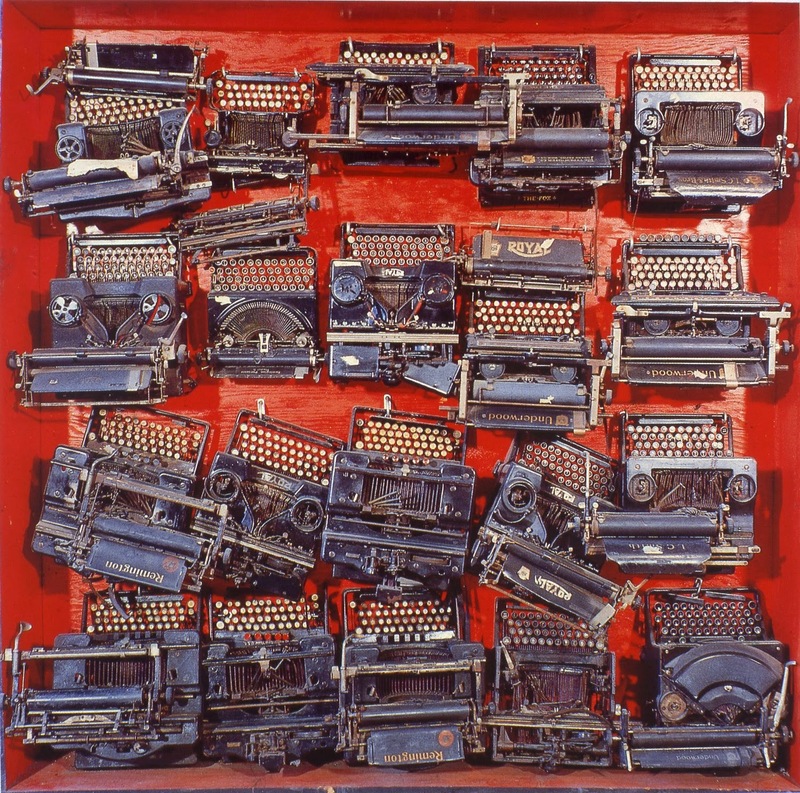 Arman's 1962 work, Infinity of Typewriters. It's a Corona 3 second from left, top row, not an Erika. 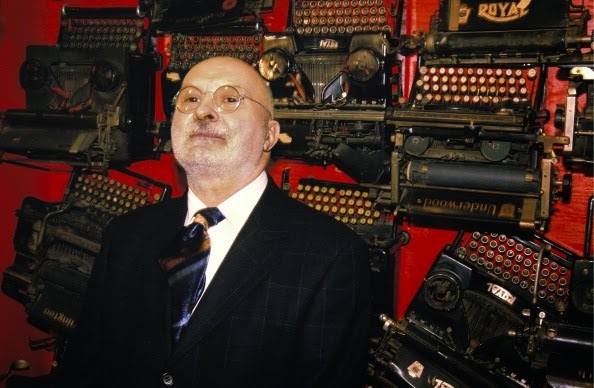 "Arman owned the Erika for many years. It sat on a shelf in his Riviera studio. He never used it for one of his works because he didn't have an emotional relationship with it, the way he did with musical instruments. "In 1975, or so, he gave the Erika to me, knowing that I'd appreciate it and take good care of it. I do and have. It sits in my office, under glass, on my desk, not far from a Hemingway-era Corona and my old, ever-faithful 1944 Royal. "Sometimes, not often but sometimes, I feel sorry for young writers who will never know the joy of hearing their words click onto paper." Jeffrey Robinson was born in Long Beach, New York, in 1945 and graduated from Temple University in Philadelphia in 1967. He served four years as an officer in the United States Air Force and at the end of 1970 moved to a small village in the south of France. 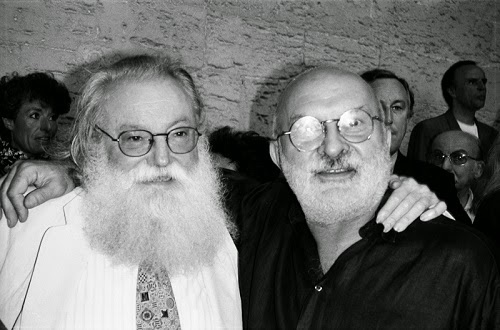 He settled in Britain in 1982 and in 2007 returned to New York. What a marvellous story. Now another typewriter I shall have to covet. Thanks for sharing Jeffrey and Robert. The life travelings of a typewriter are always very fascinating. And to have belonged to Hemingway... woa! Very nice. It's comforting to know that paper records that old can and do survive. There's just something about those folding portables. This really made my day. Thank you! I felt my heart sink when I read about the cabbie tossing out and destroying the Corona. What a delight to know the history of this Erica. Yet another typer to covet, for sure.